Habit: Erythronium revolutum is a flowering perennial which grows from a thick, scaly corm (bulb-like underground stem). Pairs of large, wavy leaves, 4-10 inches long, grow at the base of the plant, forming a dense clump. The shape of the leaves is oblong to lanceolate; color is dark green, mottled with lighter green or maroon. Usually one nodding flower blooms at the tip of long, erect scapes. Flowering stalks can reach up to 1 feet tall. Five rose-pink tepals with a yellow band at the base form the conspicuous flowers. The tepals are slightly bent backwards, revealing protruding yellow anthers at the center. Ecology: it is found in open woods, meadows and along stream banks, usually places which are wet and muddy in early spring. It is a native species of the Pacific Northwest, occurring mostly in coastal areas, from southwestern British Columbia to northwestern California. Growing conditions: it is adapted to a broad spectrum of lighting conditions, from shady to entirely sunny. This species grows best in humus-rich, well-drained soils, but tolerates boggy grounds as well. Plants should be allowed to dry out at the end of the summer, so that they can go dormant. It is a lovely plant for a dry meadow or rock garden. 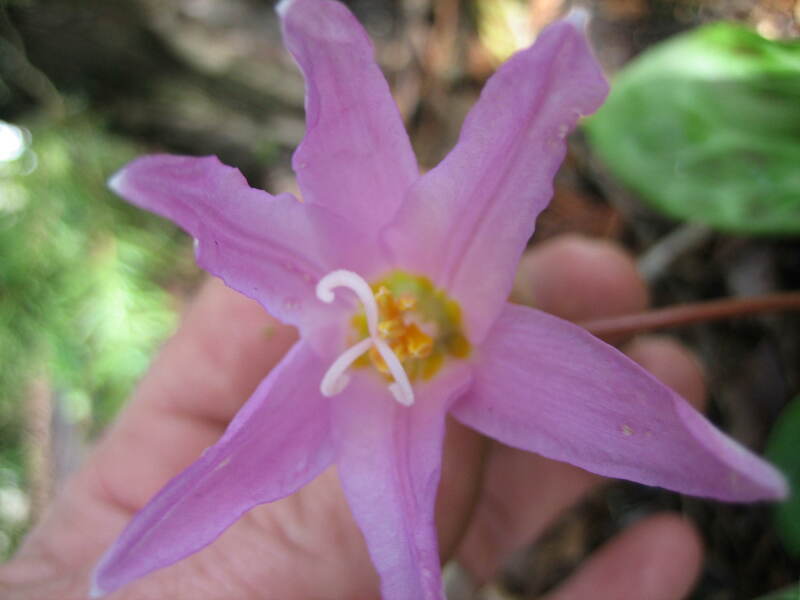 Erythronium revolutum is an edible plant. Its scaly corms were eaten by many groups of Native Americans. They have a bitter, milky taste, but are also cool and moist inside and were enjoyed as a refreshing food for hot days. The common name “fawn” was chosen by John Burroughs, an American naturalist and writer from the 19th Century, who thought the pairs of mottled leaves resembled the pricked ears of a fawn.